If you’re interested in working with native English-speakers and pursuing a career in international business this is a great opportunity. You’ll gain valuable translation experience and learn how to translate naturally and effectively. It’s great activity to put on your resume and to tell future employers. The volunteer team will be lead by Nagoya Players’ Production Manager, Yoshiko Matsushima. 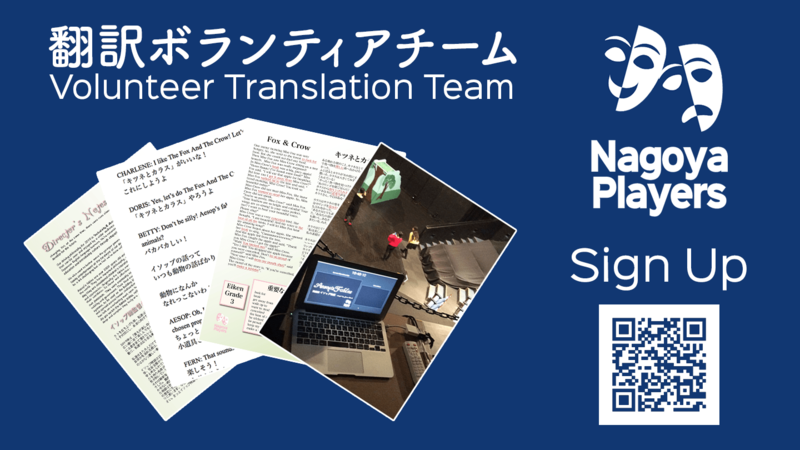 Volunteers will be asked to help with English-to-Japanese translations. Many of the assignments will be between 100~500 words. They will focus on announcements, show information and social media posts. Assignments are distributed weekly. Most translations will be needed within 72 hours of being assigned. Longer translations will be given a week or more. We will do our best to give volunteers as much time as possible to work on them. If you’re interested in volunteering please fill out the form above. Please include your name, availability, and English proficiency level (i.e. TOEIC, EIKEN, STEP test scores). Please also mention why you are interested in translation-work and volunteering.